At every turning of history God raises up great saints in order to strengthen the supernatural hold over souls exercised by the Church in virtue of her divine mission. The Roman Empire had crumbled down and the Barbarians had invaded the whole of Europe. Then appeared Benedict, as chief of the monks of the West. He was born at Nursia, in Umbria, in 480. Sent to Rome for his studies, but already endowed with the wisdom of age, says St. Gregory, he fled from the world to the solitude of Subiaco. After spending three years in a cave he attracted crowds by his virtues. The great Roman families sent their children to him and he soon founded in the mountains twelve monasteries "schools for the Lord's service", where, under the direction of an Abbot, the monks learned, by the exercise of public prayer, of private prayer and of work, to forget self and live in God. 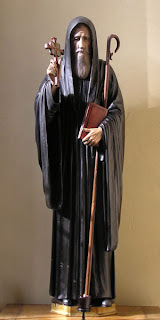 St. Benedict, in the Holy Rule, orders the examination of novices to ascertain if they are full of solicitude for the work of God, for obedience and for humiliation". As "idleness is the enemy of the soul'" the holy Law-giver adding example to his words, showed his disciples how they were to clear lands and hearts. Uniting manual labour "with constant preaching to the pagan population of Monte Cassino" he left to his sons the monastic motto: Ora et labora: pray and work. Forty days after the death of his sister St. Scholastica, St. Benedict, standing at the foot of the altar where he had just, by holy Communion, taken part in the sacrifice of the Mass and of Calvary, and supported by his disciples who surrounded him, gave up to God his soul transfigured by 63 years of austere penance and of fidelity to the divine law which he kept in his heart (Introit). This was in 543. Like Moses on Sinai (Epistle), Benedict on Monte Cassino was the Lawgiver of his people, and God established over His house this prudent servant (Communion). "The Holy Rule," as the Councils called it, "inspired by the same Spirit who has dictated the Sacred Canons" has sanctified thousands of souls which, especially during the six centuries when no other important Order existed in Europe left everything following the example of the glorious Patriarch of the West (Gospel), to enroll themselves in the militia of Christ under the Benedictine observance. (A recent commentator mentions 57,000 known Benedictine saints, of which 5,555 for Monte Cassino alone.) The first of his precepts recommends not to prefer anything to the liturgical worship in which adoration finds its most perfect expression. By his life he powerfully co-operated in the work of redemption and his glorious death has made him the patron of holy dying. "Let us keep our lives in all purity so as to atone for and correct during the holy season of Lent all the negligences of other times." (Holy Rule, ch. 49). Gaudeamus omnes in Domino, diem festum celebrantes sub honore sancti Benedicti Abbatis: de cujus solemnitate gaudent Angeli, et collaudant Filium Dei. * Magnus Dominus et laudabilis nimis: in civitate Dei nostri, in monte sancto ejus. 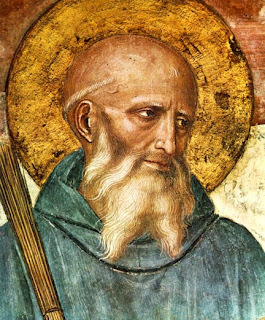 Let us all rejoice in the Lord, celebrating a festival in honour of the holy Abbot Benedict; at whose solemnity the Angels rejoice, and give praise to the Son of God. * Great is the Lord, and exceedingly to be praised: in the city of our God, in his holy mountain. Omnipotens sempiterne Deus, qui hodierna die carnis eductum ergastulo sanctissimum sublevasti ad coelum: concede, quaesumus, haec festa tuis famulis celebrantibus cunctorum veniam delictorum; ut, qui exsultantibus animis ejus claritati congaudeant, ipso apud te interveniente consocientur et meritis. O almighty and everlasting God, who didst this day deliver out of the prison of the flesh thy most holy Confessor Benedict and bear him up to heaven, grant, we beseech thee, thy servants, who are celebrating this festival, forgiveness for all sins, that in the gladness wherein they are united in rejoicing at his glory, they may by his intercession before thee partake also in his merits. Joyful rest of our leader, that brings the gift of a new light, we commemorate you today. Grace is given the loving soul, may our ardent heart be united to the songs of our lips. By the radiant way going up to the east, let us admire our Father rising to heaven, equal to the patriarchs. His innumerable posterity, figure of the sun, made him like to Abraham. See the crow serving him and recognize hence Elias hiding in a little cave. It is Joseph through his life without stain; it is Jacob bringing future things to mind. May he be mindful of his people, and may he lead us till we behold with him the eternal joys of Christ.